Genetic damage caused by asthma shows up in circulating blood stream. The study, which was conducted in an animal model that mimicked human asthma, was the first to assess the role of IL-13 in genetic damage to cells, or genotoxicity. Asthma is a very widespread disease, and the team showed for the first time an association between asthma and genotoxicity in peripheral blood. This is important because it shows a whole-body effect from asthma, not just damage in the lungs. The group observed that IL-13 increases important elements of the inflammatory response, including reactive oxygen species molecules, ions or very small molecules that include free radicals. The research team found that ROS-derived oxidative stress induced genetic damage with four types of systemic effects in the peripheral blood, oxidative DNA damage, single and double DNA strand breaks, micronucleus formation, and protein damage. The team summise that all four effects causes the chromosomes to become unstable, which could result in a variety of other diseases. The researchers found four different markers of DNA damage and one marker of protein damage in blood cells in the body periphery, which was very surprising. This could indicate that other organs in asthmatics have a higher risk of developing disease. The team will next attempt to use chemicals that help repair the DNA of damaged cells. Their goal is to determine whether doing so can make asthma less damaging by reducing genetic instability in the peripheral blood supply. IL-13 Receptor alpha 1 in Human Skin. Interleukin-13 Receptor alpha 1 (IL-13 R alpha 1) was detected in immersion fixed paraffin-embedded sections of human skin using Human IL-13 R alpha 1 Antigen Affinity-purified Polyclonal Antibody. 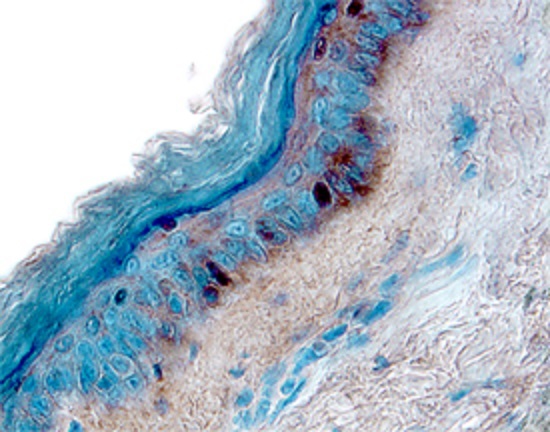 Tissue was stained using the Anti-Goat HRP-DAB Cell & Tissue Staining Kit (brown) and counterstained with hematoxylin (blue). ©2014 R&D Systems, Inc. All Rights Reserved. Reblogged this on someone somewhere.